Frustration, depression and exasperation are conveyed in thousands of news stories and blog posts about the latest serious food-borne illness outbreak -- salmonella in fresh tomatoes. A Google News seach for "tomatoes salmonella" identifies more than 2,700 stories, many that will make farmers cringe. The San Francisco Chronicle ran an editorial titled "Killer Tomatoes." A headline in the Boston Herald says "Red scare intensifies." "Why in the hell can't they figure out where it's coming from and sanction that one producer?" - Madera County organic farmer Tom Willey quoted in the Fresno Bee. "The industry has been extremely concerned and frustrated." - Ed Beckman, president of the California Tomato Farmers, quoted in the San Jose Mercury News. "It's been blown into a level of hysteria." - Lucky Lee, vice president of sales for New York-based Lucky's Real Tomatoes, quoted in the Los Angeles Times. "Contamination of fresh tomatoes with polluted water is a big concern on Mexican farms." - Trevor Suslow, UC Davis postharvest pathologist, paraphrased in the Sacramento Bee. "Hothouse tomatoes are grown indoors along the West Coast from British Columbia to Mexico. They are typically picked ripe, and then, without being washed, are immediately put into plastic containers labeled with codes that allow tracking all the way to the store shelf." -Jim Gorny, director of Postharvest Technology Research and Information Center at UC Davis, paraphrased in the Sacramento Bee. "Statistically, the frequency of salmonella tainting tomatoes is low. But since the tomato is such a popular item, the chances are greater that salmonella scares will be associated with it." - Suslow, paraphrased in the Chicago Tribune. "With great sadness I've been following the recent Salmonellosis foodborne illness outbreak associated with tomatoes. From a regulatory perspective this current scenario is unfolding in manner so ominously reminiscent of the incident in September 2006 that it sends a chill up my spine." 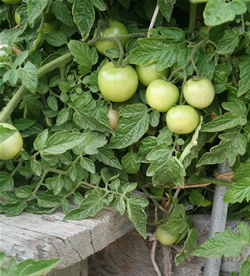 Most California tomatoes are not yet ready to be harvested. Great collection of quotes. "Chilling" indeed.